Summer always seems to come out of the blue. In my eyes, anyway. I had of course realized that the temperatures and the humidity had been inching up over the past month or two. I had also remembered that our monsoon season would invariably be followed by a summer. And I had even known that it would usually hit us sometime in mid July. All of this, however, did't mean I was well prepared for the summer to arrive so suddenly. Rather, it seemed to have happened overnight - before I knew it, it had become too hot for me to go outside during the day, or do anything, really. I have spent these past few weeks barely up, feeling dizzy, and unable to stay alert and do anything productive. Other than making ice cream, that is. It seems to help keep my sanity - and cool. At least that more or less worked last time. 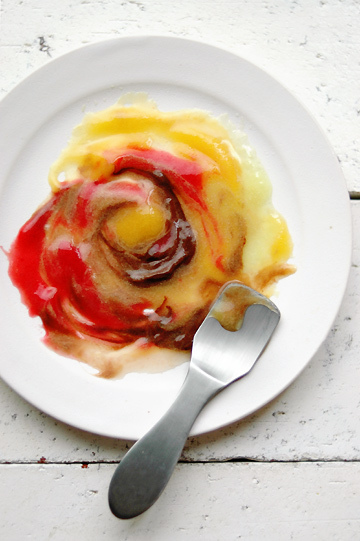 I don't know what threw me into the ice-cream making frenzy last summer, but one thing that I do know was big was the extraordinary mango and chocolate sorbets I had had from Jean-Paul Hevin while in Paris earlier the year. Dreamily rich and light, I remember how they were both packed with intense flavors, with their star ingredients (mango and chocolate, respectively) singing out loud. Coming back in Tokyo, I'd think about them a lot, and eventually resolved to recreate them at home. Now looking back, I never really managed to accomplish my lofty goal. Along the way, though, I did come up with some fairly good mango and chocolate sorbets, as well as scoops after scoops of ice cream and sorbet of other flavors - mostly good, and some really good, which more than compensated for a few disappointments. So overall, it was fun to play with different flavors, and I found it rather therapeutic, even - thinking about what to make next, working with an ice cream/sorbet base, and eating the frozen bliss that came out at the end of the process, of course, were all quite soothing and helped me cope with the heat in a delicious manner. For this year, I have already churned up more than handful of ice creams including ones with lychee and cherry. But today I thought I'd share a brief look back and see what I was doing a year ago - and for the next few minutes let us not think about how much cream and sugar I consumed over the summer! Like I said, it somehow started with the mango sorbet I had from JPH in Paris. I looked around on the Internet in search for the 'right' one, although I soon realized that it would be a little tricky, as most, if not all, of mango sorbet recipes looked rather alike in a sense that they all use a very few ingredients: mango and sugar. With so many similar-looking recipes around, I wasn't sure where to begin with. That was probably why a certain recipe captured my eyes. It was called Roasted Mango Sorbet, and the words 'roasted mango' alone were interesting enough for me to take a close look at the recipe. As I did so, I found another interesting thing about the recipe: it used mashed banana, and mind you, this was not a recipe for 'mango and banana sorbet'. Intrigued, I decided to give it a try, despite the obvious fact that I'd have to roast mangoes, a task that seemed rather daunting as it involves turning the oven on in the sweltering kitchen. 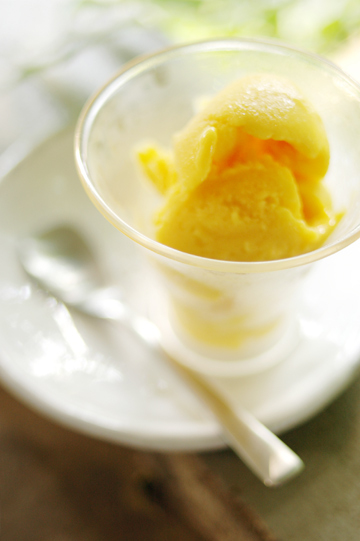 But my efforts were well rewarded and I was pleasantly surprised with the end result, a rich and very mango-ey sorbet. I think the roasting process worked to concentrate the sweetness and flavor of mangoes. And I should mention that the sorbet didn't taste much of banana, which I suppose was more to give body to the sorbet rather than the flavor of banana itself. I can't remember how it occurred to me, but I managed to take the trouble and gave the sorbet another look by molding it in chocolate cups. 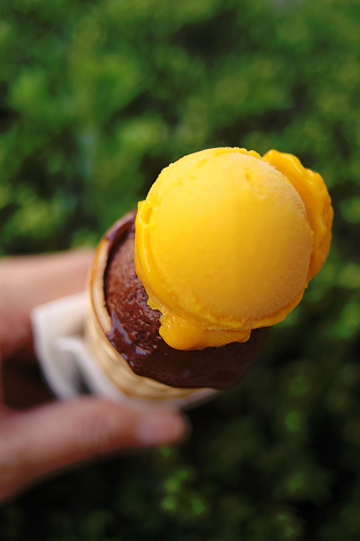 You can't go wrong with the combination of mango and chocolate, right? I simply melted bittersweet chocolate and smeared it on the inside of silicone mini-muffin pan, and chilled it in the freezer to harden the chocolate, which were then filled with some softened sorbet. I topped each morsel with a few blueberries to an extra layer of flavor, but I couldn't help but thinking that they looked rather like some sort of extraterrestrial life... well, never mind. As much as I liked this rich and creamy sorbet, it still wasn't like the one I had had in Paris, which had a light and clean taste with just the right amount of tang. So I went on and tried another recipe. 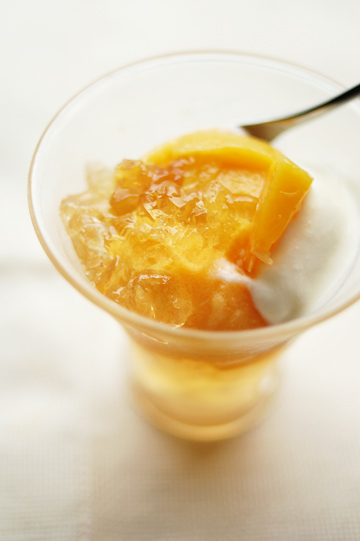 This one was called Mango, Rose-water and Lime Sorbet developed by Skye Gyngell, the celebrated head chef of the cafe/restaurant at Petersham Nurseries in Richmond in Greater London. I adore the place and have always enjoyed her recipes, so I couldn't pass on her version of mango sorbet, even if it was, again, not likely a recipe to produce a 'simple' mango sorbet like the JPH one I had, with the use of rose water and lime as added flavors. That said, other than the addition of such flavors, it was quite a straightforward one to make, and it tasted light and sharp with a good zing of lime. As far as mango sorbet goes, however, it wasn't the taste I was looking for, and one major factor must have been the mangoes I used; they weren't fully ripe, and were, quite frankly, mediocre in the first place. I'd probably need to use better specimens to fully do the recipe justice. My quest for the perfect mango sorbet continued to take a diverted route, and the next thing I tried was even farther away from the 'real' stuff. The recipe was for mango and orange sorbet, but I ended up with Mango, Orange and Peach Sorbet by replacing about half the amount of mango with peach. 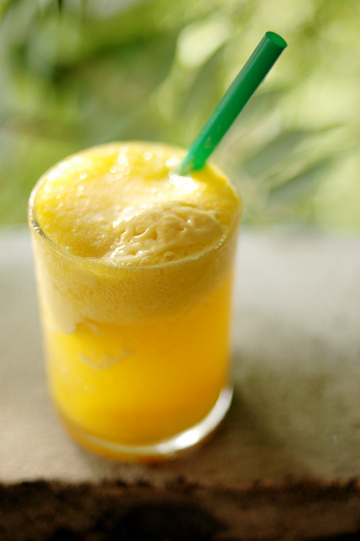 With the addition of juice of orange, the sorbet was more slushier than the others, and actually made a great smoothie (slushie?) when slightly thawed - thus inspiring the picture above. 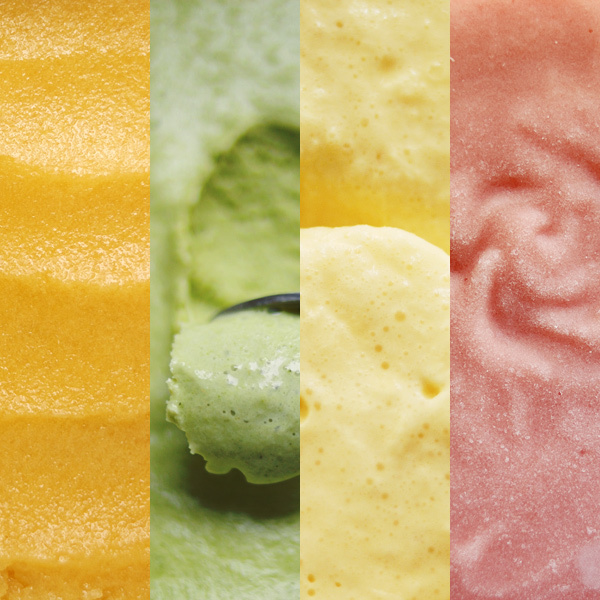 And if, by the way, you happened to try and guess what the flavors were for some of the ice creams and sorbets from a piece of photo in my last post, well, this was the orange one shown at the far left of the first image! Now back to more simple mango sorbet: the next and the last one I tried last year turned out to be closest to the JPH one, which is particularly why I find it a real shame that the recipe, called Sweet Mango Sorbet on the Whole Foods Market website, is no longer available. 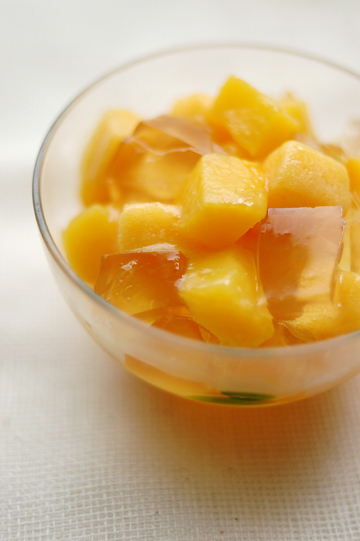 As far as I remember, though, there was nothing notably peculiar about the recipe, and I suspect that it might have been, again, more of the matter of the quality of mangoes I used than the recipe itself; for this one, I did make sure I used sweet, ultra-ripe fruit. Nonetheless, I just wish I had taken a note of the recipe. All that I remember about it is that it used ginger as a flavoring, but I omitted it to (finally) make a simple mango sorbet. I found the recipe while searching for ones for mango sorbet. It tells you to use an artificial sweetener, but I ignored it and just used sugar. I also used a lot more heavy cream than it was called for in the recipe because, um, I didn't want to be left with some odd amount of cream. I made the ice cream, not sorbet, for I wanted to try something I'd seen in the August 2008 issue of Gourmet magazine. It was Mango Ginger Float, whose recipe can be found online here. Pureed flesh of fresh mango was mixed with sugar and juice of lime, and topped with a scoop of mango ice cream and ginger ale. While I don't consider myself a big soda drinker, I have a soft spot for ginger ale and couldn't resist the idea of making floats with it. I took a liberty of adding a squeeze of ginger juice to the mixture, and I wasn't sorry at all! 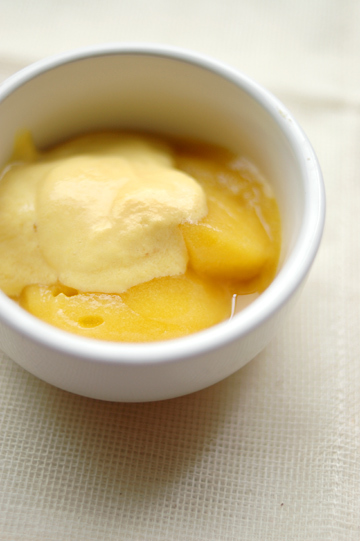 While I never became able to reproduce the Jean-Paul Havin mango sorbet, my obsession with it led me to a broader world of sorbet making, using fruits other than mango, such as plum and melon. 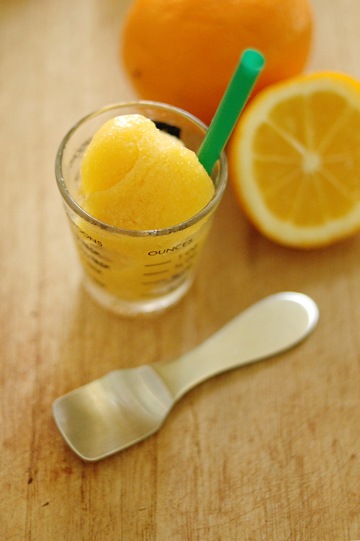 With any fruit, you'd basically puree the flesh and add some sugar or simple syrup along with a small spoonful of a spirit (usually vodka) to give your sorbet a smoother texture. 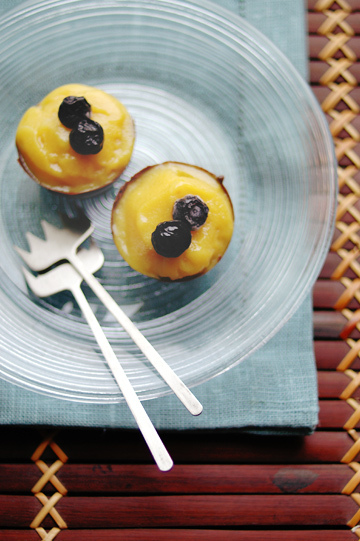 You might also want to add a splash of juice of lemon to obtain the best sweet-tart balance. 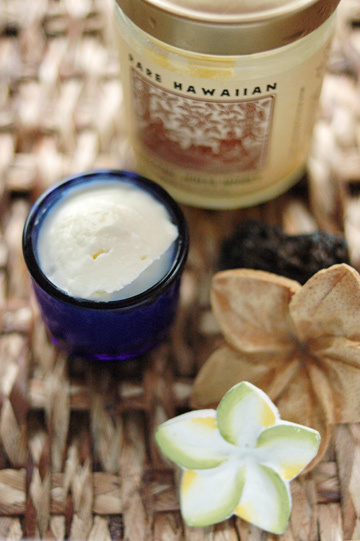 That's pretty much it and you'll end up with an icy, luscious treat bursting with flavor of the fruit of your choice. 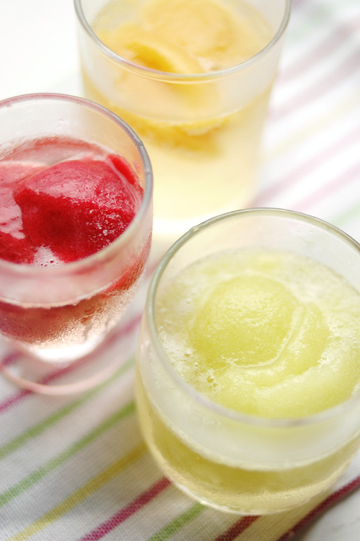 Topped with some chilled prosecco (or any other type of dry sparkling wine), sorbets make a fabulous drink that pleases your eye as well as palate, especially on a warm summer day. While lemon or raspberry sorbet seem to be a common choice for this concoction, almost any fruit sorbet would work, like the ones with mango, melon, and plum here. So I'd made a lot of fruit sorbets over the summer and most of them turned out pleasantly good, but there was one that I fell completely head over heels in love with. It was a peach sorbet. To be more precise, it was (a part of) White Peach-Rose Champagne Gelee with Champagne-Peach Sorbet, which consists of three forms of white peaches poached in rose champagne: the peach-scented poaching liquid makes gelee, while some of the peaches are turned into sorbet, accompanied by slices of the poached peaches. And this white peach and rose champagne sorbet is the one you might have seen in my last post - shown at the far right of the first image. This beautiful dessert is from a beautiful book written by Claudia Fleming called The Last Course: The Desserts of Gramercy Tavern (Random House, 2001). The immensely talented pastry chef formerly at Gramercy Tavern in New York City and now at The North Fork Inn in Long Island, Fleming shares a variety of refined dessert recipes, both simple and elaborate, in this stunning book. I've tried several recipes, all relatively simple ones I must admit, and this one involves slightly more steps than some others I've tried, yet the resulting plate was an absolute stunner. This probably is the best recipe I've tried from the book so far, and might well have been the best thing I made last summer. At first, to be honest, I wasn't going to make the whole thing. 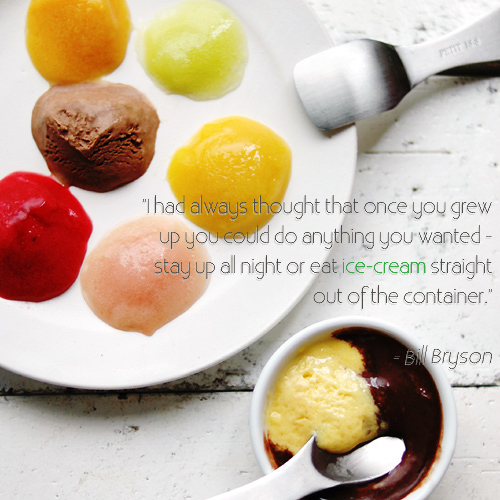 I was hooked on sorbet making, and was on the lookout for sorbet recipes. Then I found this one as I flipped through the book, and was instantly drawn to the idea of pairing white peach with champagne (peach happens to be one of my favorite things to pair with bubbles). Being a lazy cook, I first intended to make the sorbet only, never mind the jelly part - only to realize that it just wouldn't go that way. 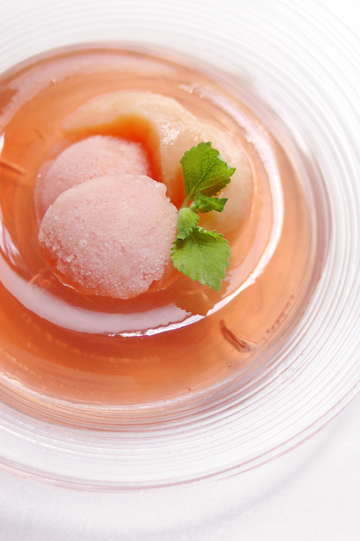 To make the sorbet, you'll have to start with poaching peaches in the wine, which will leave you with a lot of poaching liquid. Since the gelee can be made simply adding gelatin to the liquid you have a lot anyway, you might as well want to make it, too. And I was so glad I did. I followed the recipe for the most part, except I cut back the sugar by half when poaching peaches - it just seemed a lot to me, and Japanese white peaches are sweeter than what you usually have in the US. Then I added a little extra sugar to the sorbet base, for too little sugar would affect the consistency of the sorbet when frozen. I also had to replace lemon verbena, which is hard to find fresh in Tokyo, with something else - I went for lemon balm and thyme. 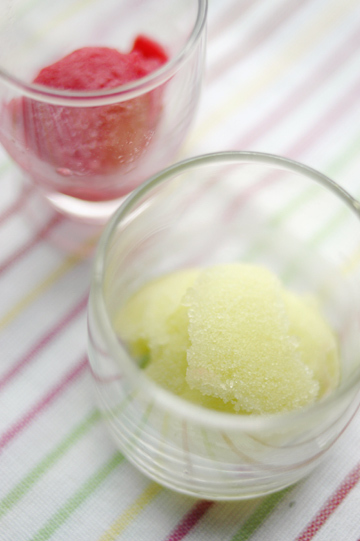 Overall, it might be a bit time-consuming to make than some other sorbets, but there is nothing complicated involved in the procedure, with the sorbet and the gelee both breeze to whip up. My only trouble, as you probably notice in the pictures here, was to unmold the gelee; I'd shake the mold, dip it briefly in hot water and everything, yet it still turned out cracked (sigh). I love parfaits, or any other desserts that come in layers in a glass, because it's more casual than a plated dessert - easier to assemble and eat! This way, it doesn't matter if my gelee isn't unmolded in a pristine state - it can be a little messy and it will still look decently good in the glass, and taste just as great. Perfect for a clumsy cook like myself. There seemed to have been not much you could do to improve upon what I already had, but I thought I'd like to add a little bit of creaminess to this airily light dessert, so I popped a scoop of Rose Water and Mint Ice Cream that I'd made from another stellar dessert book, Pure Dessert by Alice Medrich (Artisan, 2007). This might just have been the best dessert I had over the summer! So much so, I made it a couple more time before the end of the summer, one of which with yellow peaches and white prosecco, for a change. And oh, what a change it all made! For this time, I didn't even bother to try and mold the gelee in a pretty shape - I just made it in an ordinary rectangular container and that was it. 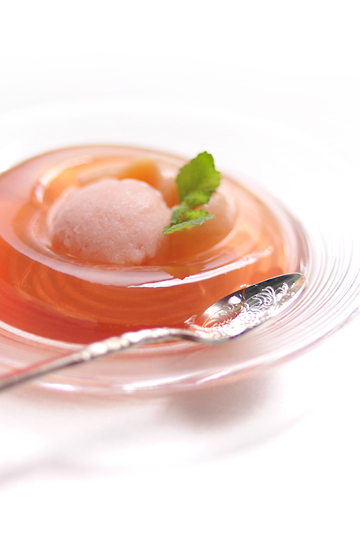 I did, however, play around a bit and cut the poached peaches, gelee, and sorbet into cubes; isn't it fun how the peaches and sorbet look almost identical, served together in a bowl like this? 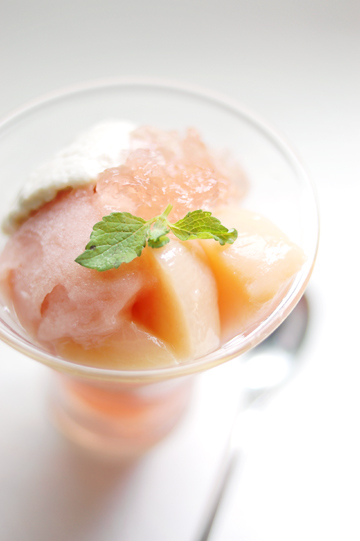 Sorbet, of course, would quickly start melting and loose its shape if left too long, but if you do it quickly, you'd be able to trick your guests who'd be amused to find out that some of the peach cubes they saw in fact were sorbet! This one also made a lovely parfait, but in whole, I must admit that I liked the original version with white peaches and rose champagne better. For one thing, I generally prefer white peaches to yellow ones, and it could also have been that I was so impressed with the dessert when I tried it for the first time. At any rate, I can totally see myself making this again this summer - it certainly is one of those desserts that you can make to impress. 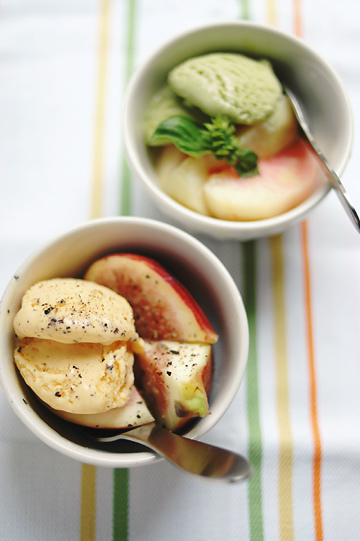 As it turned out, the book had a lot of recipes for frozen desserts, both ice cream and sorbet, and some of them looked rather interesting, such as the ones pictured here: Black Pepper Ice Cream and Basil Ice Cream, shown alongside of fresh fig and peach slices, respectively. A friend of mine used to tease me, jokingly (or she might have been totally serious) pointing out that I'd put black pepper over anything and everything I eat, savory or sweet. Which actually has some truth in it; in my book, there are few things that do not taste better with a few good grinds of black pepper. So it seemed quite natural to me to perk up a rich, custard-based ice cream with the magic spice. Although the one in the picture above is topped with ground black pepper, the recipe itself does not call for it; rather, you'll steep some crushed black peppercorns in the ice cream base to infuse it with the flavor of the spice and remove them before churning it into ice cream. So the peppercorns themselves are not noticeable when you serve the ice cream, but a note of the pungent spice is anything but. As for the basil one, I'm quite into using herbs that are normally associated with savory dishes in sweet things, and this, too, sounded brilliant to me. The procedure here was more or less the same as the mint ice cream (another Skye Gyngell recipe that can be found here) that I'd made a couple of years ago, which happened to be the best mint ice cream I've ever eaten. The key to getting the clearest color and flavor of the herb is to blanch it first, and refresh it in ice water. This really does make a whole difference, as both mint and basil tend to have some bitterness and turn brown quickly after chopped. 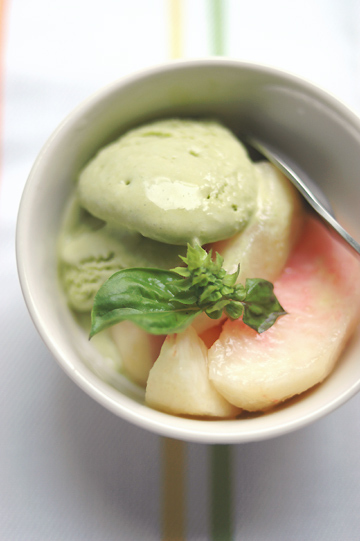 While it wasn't as vibrant green as the mint ice cream was, basil still gave the ice cream a gentle shade of green, and tasted both sweet and pungent, and an unmistakable flavor of the herb. It went beautifully with slices of fresh white peaches. And this, in fact, is the identity of a third mystery in one of the little quiz: the green, matcha ice cream-lookalike shown at the second from right of the first image in my last post. 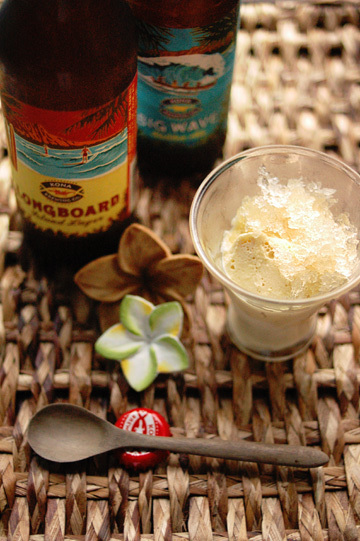 It was Beer Ice Cream, another intriguing recipe from Pure Dessert, made in my case with a Hawaiian ale from Kona Brewing Company. Here, the ice cream was topped with Beer Granita, also from the same Alice Medrich book and made using another beer from the Kona brewery. You can read more about these unusual, but nonetheless pleasant frozen creations in one of my old posts, here. 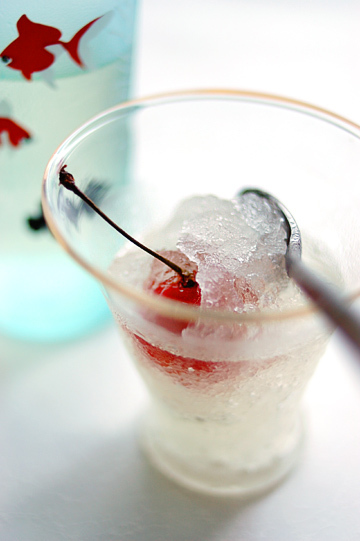 Speaking of beer granita, by the way, I'd also made another boozy and slushy little thing using sake, which was merely a byproduct, rather than the purpose, of my purchase of irresistibly cute bottles of sake. 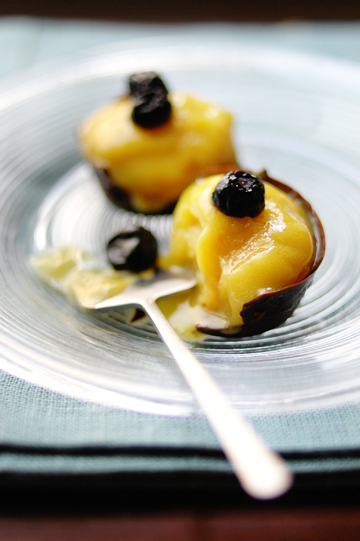 Now, like The Last Course, Pure Dessert is full of mouth-watering dessert recipes. And as far as frozen desserts go, it had some most addictive ones, including those using chocolate. 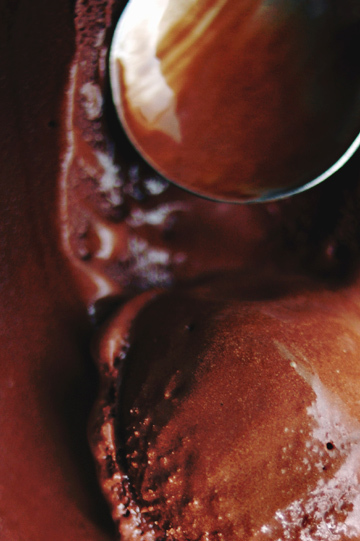 The book has several chocolate sorbet recipes in it, and one of them is milk chocolate sorbet. It is a sorbet in a sense that it does not use milk or cream, but milk chocolate, unsweetened chocolate, and boiling water, that's it. As Medrich notes, however, you can also argue that this is an ice cream, as the milk chocolate itself has a high milk content to begin with. Now, as far as I'm concerned, I'm not exactly fond of chocolate ice cream in general; I love chocolate and I love ice cream, but somehow, chocolate is not something I tend to choose when it comes to ice cream flavors. So if the recipe was called 'chocolate ice cream', I would probably not taken a closer look. And it was really lucky for me that it isn't called ice cream. Because this short, one-page recipe turned out to be filled with tasty inspirations! For one thing, the author notes that you can use coffee in place of water, making it Milk Chocolate-Coffee Sorbet, which sounded rather exciting. And if you can use coffee, I wondered, you can probably use tea, too - why not? As it happens, I'd had some Belgian chocolate from Dolfin, and one of them was Rooibos tea-flavored milk chocolate. The earthy but delicate flavor of Rooibos tea mingled well with milky chocolate, and I thought I'd give it a try myself - hence Milk Chocolate-Rooibos Sorbet. 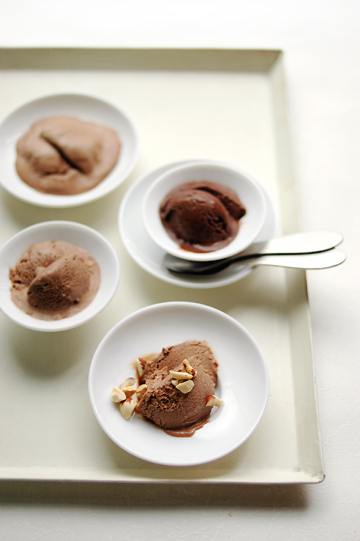 There was also a variation of the milk chocolate sorbet presented in the book. 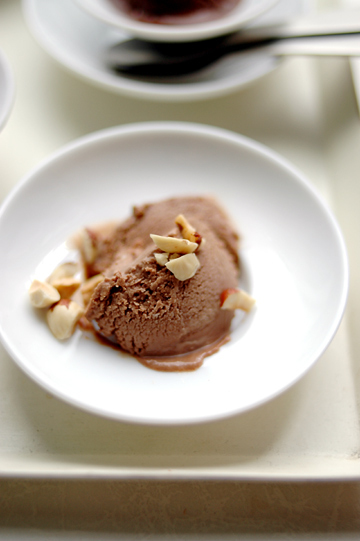 It was Gianduja Sorbet, for which you use milk chocolate-based gianduia instead of the milk chocolate. Now this sounded insane, if you ask me - in a good way! As if milk chocolate sorbet wasn't rich and decadent enough? Oh come on! It was also lucky for me that my local baking supplies store carried chocolate-based gianduia (from Cacao Barry); it is not exactly a common ingredient around here. For the other two milk chocolate sorbets, I used Jivara Lactee from Valrhona, a milk chocolate sweetened with brown sugar. I also used unsweetened Valrhona for all three sorbets. Having blown a small fortune on chocolates (even if I'd made each of them in a quarter of the amount given in the recipe, which uses a pound! of chocolate - I could have gone bankrupt), I was so relieved, and even more delighted, with what came out of the freezer. I made them all at once, and they were all nothing short of excellent, each in a unique way, despite their resemblance in appearance. The gianduia sorbet, pictured above topped with chopped roasted hazelnuts, reminded me a lot of Nutella, but not as heavy and sweet. The coffee one was like Starbucks Mocha Frappuccino, only a lot richer and creamier and more chocolate-y. Rooibos tea was more subtle, and you might not tell it's Rooibos-flavored if not told so. I'd used a Rooibos Early Gray tea, but I should probaly brewed the tea a little stronger. It still had an undoubtedly lighter and cleaner taste. I wouldn't be surprised if you couldn't figure out what these ugly lumps were right away, but they were intended to be, ahem, Milk Chocolate Sorbet Sandwiches. 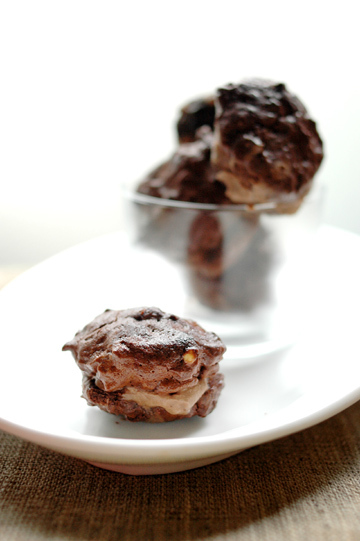 Cookies were, again, from The Last Course, in which Fleming does suggest to fill these chocolate brownie cookies with chocolate ice cream to make sandwiches. I'll admit that the cookies didn't look as sophisticated as they were meant to be, but I'd daresay it might to a degree be worth a recognition that I actually braved the heat to turn the oven on and bake cookies. 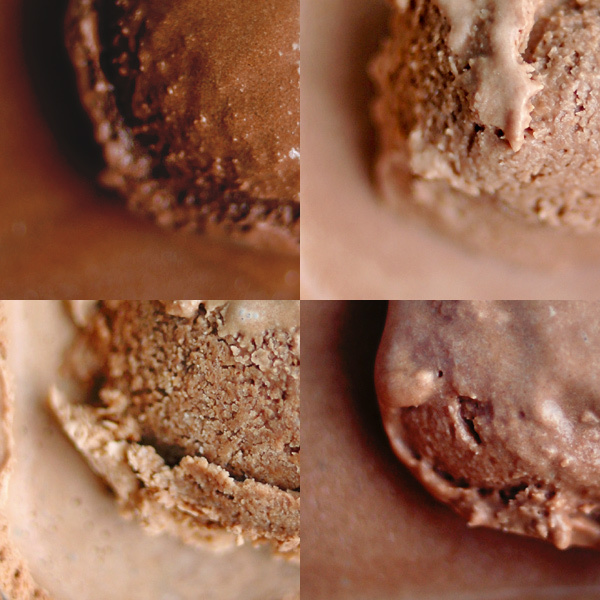 Now it is impossible for me to tell from this photo which sorbet it was that I used for, say, the sandwich pictured in front, but I should at least make an effort to tell you which was what in the second quiz in my last post; in the second image, the top right was gianduia, the bottom left was coffee, and the bottom right was Rooibos. Their tastes aside, it was certainly a bit tricky not only for you but for me, too, to tell them apart! So, what is the fourth one, pictured at the top left, then? Its darker shade alone should be enough for you to distinguish this one apart from the rest of the clan, which were all milk chocolate-based. And this one, indeed, was based on dark chocolate. But like the other three, it was also a sorbet and not an ice cream. You might have gotten that bit, too. What is not instantly recognizable is that this was flavored with chili, cinnamon and black peppercorns, making it Spiced Bittersweet Chocolate Sorbet. Now if you remember that I'd mentioned sorbets I had from Jean-Paul Havin in Paris earlier (which seems like a lifetime ago - can't believe we are still on the same post! ), I liked the chocolate sorbet, just as much as the mango one. And further back into the history (just a few months, actually, but anyway), I'd had a spiced bittersweet chocolate sorbet at the MarieBelle tea room in New York, and had been quite hooked. So I was eager to make something similar on my own, and it went largely good. I used a recipe from The Last Course, called extra-bittersweet chocolate sorbet. You first boil sugar, water, and (unsweetened) cocoa powder to make a chocolate syrup, and here I added some chopped chili peppers, a cinnamon stick and crushed black peppercorns. Simple enough. Loaded with bittersweet chocolate and cocoa powder, the sorbet looks dark enough to mask any other color that might have been added to it, but the flavors of spices were far from being masked - one bite and you'll be knocked over with the heady spiciness. Well, it wasn't that spicy, to tell you the truth, but there was a definite kick to it, all the same. 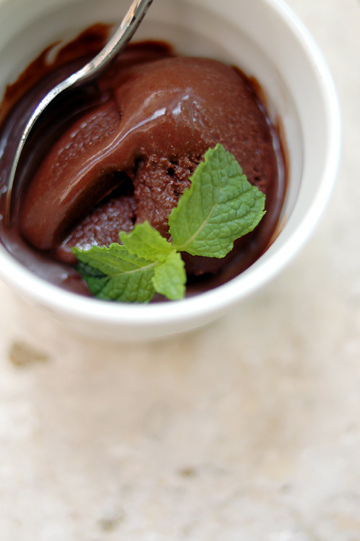 As a side note, I'd also made a simple, spice-free bittersweet chocolate sorbet using another recipe (from Skye Gyngell's first book, A Year in My Kitchen [Quadrille Publishing, 2006]), and it was good, too - but I just can't get enough of a little spiciness in my food! Back to Alice Medrich - there was another chocolate thing I made: what do you reckon this one is? 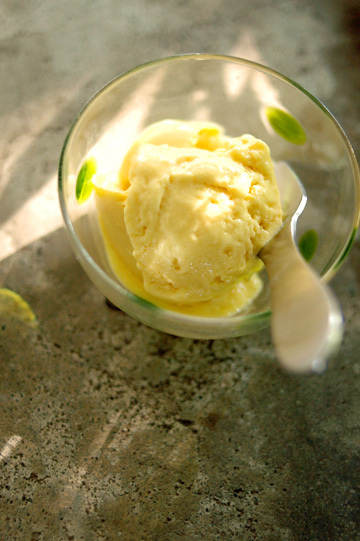 We've seen milk and dark chocolate sorbets, so you might perhaps think it is now a white chocolate sorbet. It sounds good, true, but this one wasn't a one. This was what Medrich calls Nibby Ice Cream in her book, and it is, yes, an ice cream (finally! ), flavored with cacao nibs, which in essence are cacao beans. Interesting, isn't it? Free of eggs and loaded with milk, this one may be as light as an ice cream could get. 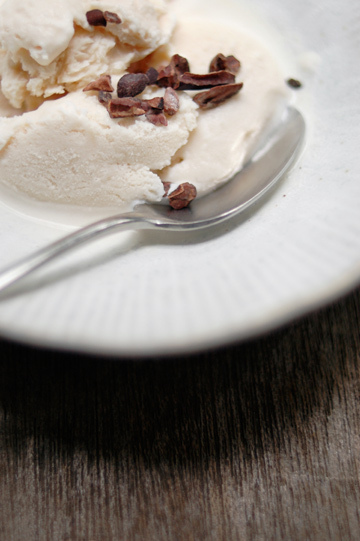 The cream and milk is infused with cacao nibs, which are then removed before the churning process, leaving the ice cream base with a hint of cacao and a tint of brown, which might not be noticeable at all if you didn't know there had been cacao in it. I topped my bowl of ice cream with some cacao nibs because I like their crunchiness, but this is absolutely unnecessary for you to enjoy the subtle flavor of cacao in the ice cream. And it would certainly puzzle your unsuspecting guests! We've seen some unusual frozen desserts by Alice Medrich, but the ace of her ice creams and sorbets (among the ones I've tried from Pure Dessert, anyway) was a simple yet unique ice cream, which might have been the best ice cream I made last summer, and undoubtedly the one I made the most, over and over again during the summer and later in cold months, too. 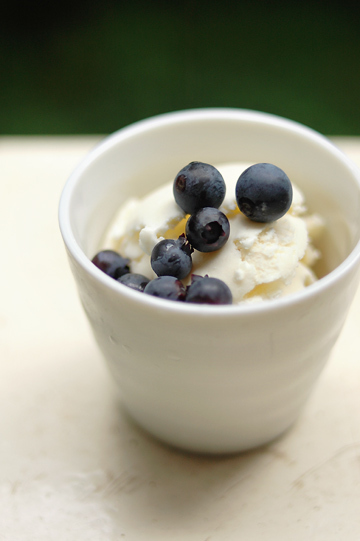 No, it wasn't a blueberry ice cream, but a one so rightfully called Heavenly Honey Ice Cream. There are many reasons to love this ice cream. It is a breeze to whip up, using a very short list of ingredients that are all easy to find: cream, milk, honey, and salt (although you do need to have top-quality everything). 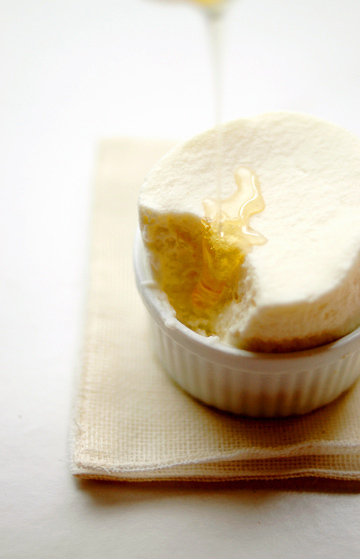 It is a wonderful way to appreciate flavor and aroma of the honey that you use, be it floral or woody, mild or strong. And the ice cream itself is incredibly light and yet rich - heavenly, you might say. It came as a revelation to me that you can make such a sublime ice cream without using eggs, and not even sugar. Granted, I do enjoy rich custard-based ice creams. Yet a little too often I don't feel like cooking up custard to make ice cream. This one, on the other hand, can be a perfect solution when I want something a little icy and creamy - on its own as well as to accompany something else. It's really versatile. I tried it a bunch of different honeys, and liked all of them - especially with apple, orange-blossom, and my all-time favorite Hawaiian white honey, the last of which went particularly well with the Hawaiian beer ice cream I've mentioned earlier in this post as well as the one from last year. This was called Frozen Orange-blossom Honey Mousse, yet another great find from The Last Course. The base was heavy cream and creme fraiche, lightly whipped and blended with whipped egg whites, making it a light-as-a-feather delicacy even when frozen. Although there is no real orange used here, you get distinct orange flavors with the help of Grand Marnier, orange-flower water, and orange-blossom honey. Here I gave it a drizzle of orange-blossom honey, but the mousse had a compelling orange flavor even without that last addition. Now I've got this feeling that you might say I was merely going back and forth between The Last Course and Pure Dessert, but you'd be right. I probably owe a lot to the two great pastry chefs, for helping me survive the summer last year. The wonderful thing is that I am nowhere close to trying all the ice cream / sorbet recipes featured in the books - so I'm looking forward to trying new things, as well as going back to my favorites from last summer. For now I'd like to share one more thing from The Last Course before I wrap up this entry - something a bit unusual, but just as good as you'd expect in a Claudia Fleming recipe; it's the one you see in the picture above. Got an idea? 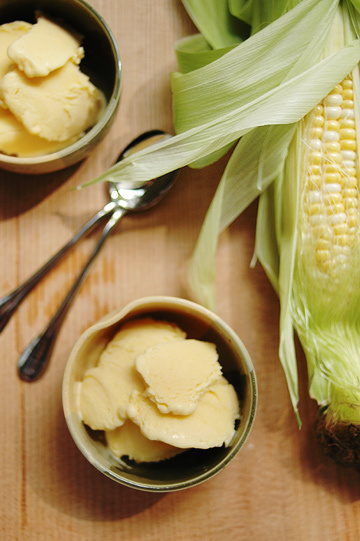 It was Sweet-corn Ice Cream, which is an ice cream flavored with - you guessed it - sweet corn. It might sound strange, but Fleming claims that it was a popular item at Gramercy Tavern, and I'm quite convinced now that I've tried it myself. Besides, sweet corn ice cream to me was never really a novel concept - I remember we used to have some sold at stores in Japan, even when I was a kid. So I wasn't intimidated to try it, though I was curious how it would turn out. While the idea was fairly simple, it does require a little more steps than I'd normally take to make a 'simple' ice cream. Cooking the corn kernels and cobs in a cream mixture, leaving them to steep, processing everything in the blender, straining the kernels, and so on. But you'd be pleased with the end result, which is free of corn kernels yet full of sweet flavor of corn. When I made this ice cream, I was staying at my mother's up in the mountains in Nagano, and was fortunate to be able to use ultra-fresh ears of corn from a local farm (they also grows corn at my mother's, but theirs were all over when I decided to make this). I also served the ice cream with blueberry compote that I'd made using some of the small crop of blueberries I had from their yard. 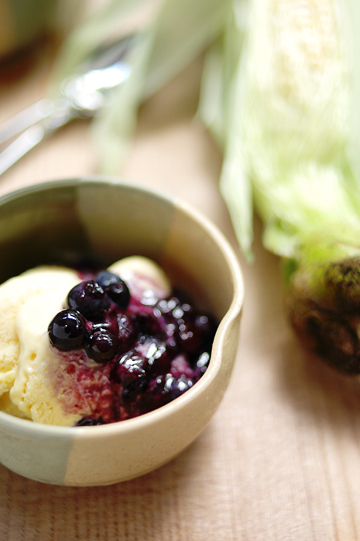 Corn and blueberry seem to go well together. The recipe, by the way, is available online here if you can't get hold of the book but would like to give this a try. I don't think you'd be sorry to get a copy for yourself, but it appears to be a bit tricky to find it these days. 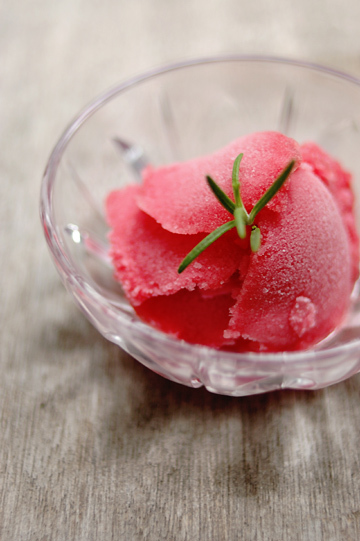 One was called Rosemary Plum Sorbet, from the book The Breakaway Cook: Recipes That Break Away from the Ordinary (Morrow Cookbooks, 2007) authored by my friend Eric the Breakaway Cook, otherwise known as Eric Gower. This one, as Eric puts it, is a 'backyard' version of an increasingly popular trend of combining savory and sweet elements, in a sense that "rosemary grows easily just about everywhere, and plum trees dominate the landscape here in San Francisco" where he is based. It would not have been so much of a 'backyard' dessert if I had made it in Tokyo, but as I was in Nagano which happens to be one of the largest producers of plums in the country, I got to use ripest and sweetest plums grown by a friend of my mother, while snipping off a few sprigs of rosemary from her front yard. Admitted, the sugar and maple syrup came from abroad, but I used spring water from one of the local sources known long for good water; tap water is good, too, really, but this made the sorbet feel even more special to me. The other one was also of stone fruits - peach and nectarine this time. I made this with my last supply of them for the year. 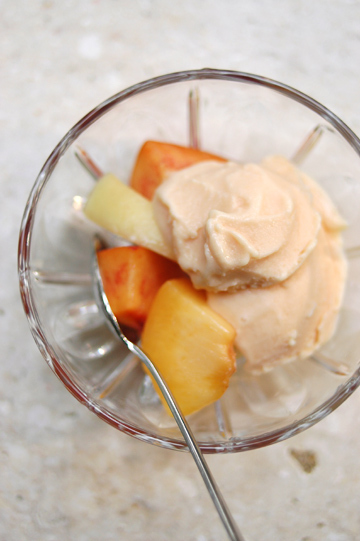 The recipe was from Moosewood Restaurant Book of Desserts (Three Rivers Press, 1997), and called Easiest Peach Ice Cream. 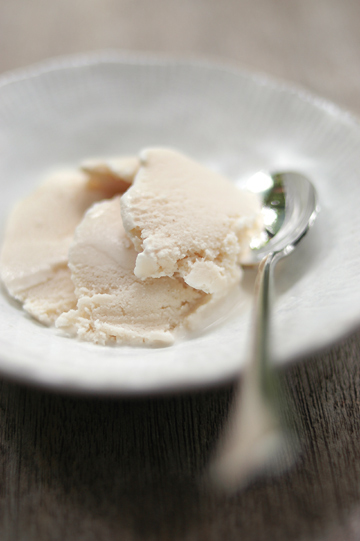 It was, indeed, very easy to make, and it was from this recipe that I learned that eggless, uncooked ice creams are sometimes referred to as Philadelphia-style ice cream. For this one, you mix up pureed peach flesh, peach juice, and half and half (I used equal parts of heavy cream and milk) along with sugar. With a high content of fruit juice and puree, It was at a lighter end of the ice cream spectrum, a perfect one to have as you said good-bye to the summer that was about to end (back then). 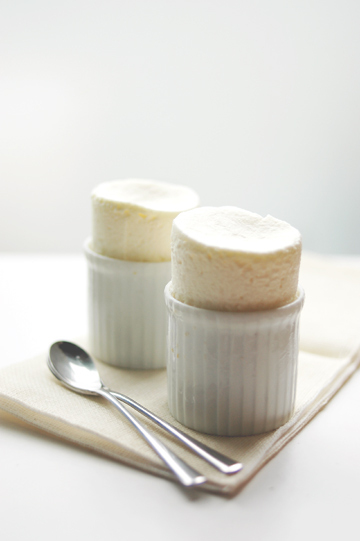 So, how many kinds of ice creams and sorbets I ended up making over the summer? I wouldn't dare to count it, but it looks like a lot of them, even though I'd typically make a considerably smaller batch for any given recipe. At one point, I think I had about a dozen different ice creams and sorbets in the freezer, and I'm glad to say that most of them were pretty good. I don't know if the things will be the same this summer, but with so many tempting recipes around, it would be safe to say that there are a lot to come! BTW, I linked to one of your older posts -- the one about roasted fruit salad. I hope you don't mind. obachan - thanks for the mention! oh yum! Those photos describe summer perfectly! Holy cow woman! Your photos are beautiful and I can see, you're an ice cream lover like myself. :) Great post! Well, this post left me breathless. Claudia - thanks for all your kind comments! but you know, these are not my recipes in the first place and I'm merely playing around with them :) certainly inspired, though! Love your post...You have got me tempted to try these amazing recipes. beautiful! My eyes is having ice-cream. Wow, I need ice cream STAT! They sure look delicious. Gorgeous pictures!